Strangely, I can't find a forum on IM for art, so posting this under this category. My partner found these at a thrift shop yesterday ($4 for the pair nicely matted and framed). They appear be to painted on cloth. They're about 4" x 6" (10 cm x 15 cm). Are these typical of a particular region in India? Who is depicted and what's the story being depicted? I tried looking at images of Hindu deities on the Internet, but my chances of finding the right ones are about 1:300,000,000 so any help will be greatly appreciated. 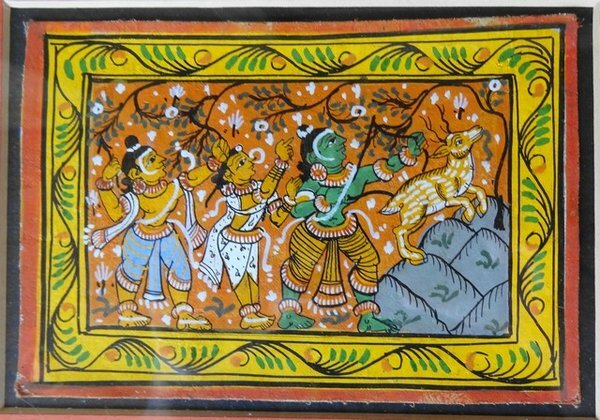 I think these paintings are from Odissa. I have similar one painted on silk and were bought in Puri. The scenes are from Ramayana depicting scenes from the period when Lord Rama was in exile. I am sure someone will chime in with more details. What a lovely thread idea. First up, I've moved it to Indian culture and traditions forum. 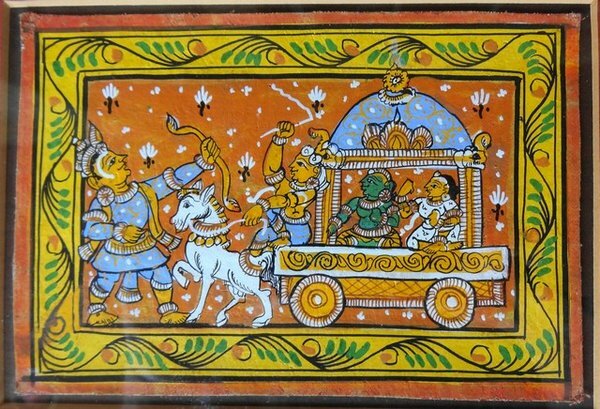 Second, as Govindpuri says, these are indeed scenes from the Ramayana and the paintings are from Odisha. I've spent quite some time looking for good patachitras so I'll chime in with what I can identify. The first one depicts the 'swarn-mrig' (Lit: Golden Deer) episode from Rama's exile in the Ramayana. Traditionally in a patachitra painting, Rama is depicted in green color and laxman (his brother) in yellow. So we see, from left to right - Laxman, Sita, Rama and the golden deer which is actually the demon mareech masquerading as the deer enticing Rama to hunt at Sita request thus leaving her unprotected. This episode is set in the Dandakarnya forest (modern day Bastar district, Chhattisgarh, India). The second one is in all likelihood from right to left - Sita, Rama and laxmana in a chariot. I cant recollect who they are battling. p.s. you got a very good deal, cheaper than what they cost here actually. Thanks, Govindpuri. And as you thought vaibhav_arora came along with a more detailed explanation. WOW!!! Thanks Vaibhav! Your identification was more than I had hoped for, right down to the village where they were painted. The link you provided on the production techniques was fascinating. On a side note, there's a museum close by that has an excellent collection of Indian stone and bronze sculpture (Norton Simon Museum in Pasadena). I have photographs of part of the collection that I was thinking of posting on IM in case anyone might be interested in seeing them. Since I couldn't find a forum for Indian art, would I post it in the culture and tradions forum? Yes, at the moment the culture and traditions forum seems the appropriate place. Feel free to start another thread therein. As an aside, you may want to see this note I wrote many moons ago about identifying and buying bronzes. This is more TN specific. The details about east Indian brass idols (dhokra) are buried in my bastar travelogue. Great to finally see traditional indian art discussions starting. The second picture does not depict rama and lakshmana holding any arms (bows-arrows), they are sitting peacefully in a chariot. Not sure what that is of though. And i don't think sita is a part of this picture. But, as per Mahabharat, Lord Krishna was all alone when taking Rukmini with her. I've been trying to figure that one out. The guy that the chariot is about to run over seems to have a bow and arrow and has shot something (perhaps a lightning bolt) that has been caught by the driver of the chariot while Rama looks on pensively and Lakshmana flexes her right bicep. Actually it is a horsewhip, not a lightning bolt! It could also be depicting the scene of Rama coming back to Ayodhya. But nobody had obstructed their way while returning! You are right. This is a strange one. davidx2, #9, lakshmana is a he, not a she. he is one of the brothers of rama. and i don't think it is depicting war at all. the charioteer is holding a horse whip, and not any arrow or such. It might be some sort of peace meeting, but no such meeting comes to mind. This discussion calls for a better understanding of Patachitras than of deities. Thus, the second painting is most likely to come from Ramayana or from another epic. Further, I've seen enough patachitras (and bought a few) to know that the the color green is almost exclusive for Lord Ram and his brother Bharat. This is supplemented by a bit of post purchase research. Yellow is for Sita and Radha's bodies as well as for Gopis. Balrama (Krishna's brother) is always white. Jagannath is always black. No exceptions. Look again, carefully. That's a 'she' in the right not a 'he'. In the Patachitra tradition, Krishna is always depicted in blue (various shades), no exceptions. However, the paintings shown here are done by a junior artist (this is quite common now as master artists are few, far between and very expensive). In which case there may be a mistake but I think the mistake is likely in the finishing (the finesse with which the faces of the deities have been painted) and not in the color scheme.